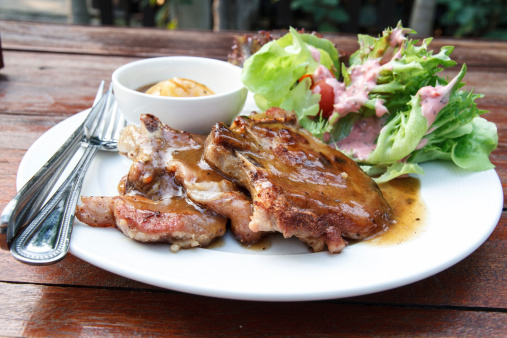 Home » Food and Nutrition » Does a Healthy Diet Include Meat? Does a Healthy Diet Include Meat? In recent years, eating meat has become rather controversial. Books like The China Study, movies like Forks Over Knives, along with increased knowledge of farming practices, have led many to believe that eating meat is harmful and can pose some serious health risks. Vegetarian, vegan, and raw diet enthusiasts have often vilified meat and made claims that it’s unnatural for human consumption because it wasn’t what our early ancestors ate. They also point out that some research has indicated meat can cause cancer and can be high in saturated fat. But is a vegetarian or vegan diet healthier than the average American diet? It surely can be. But it’s not meat that detracts from the nutritional value of American food. The problems are associated with sugar and salt, portion sizes, over eating, and snacking. At least two studies illustrate that meat and cooked food were an essential part of human evolution and largely responsible for making humans “human.” These studies indicate meat is a natural part of the human diet and played an important role in our development as a species. Both of the studies show it’s biologically implausible that humans developed such large brains without eating meat. Key nutrients only found in meat, along with the caloric content, are what led to current human brain size, brain health, and functionality. The modern human brain consumes 20% of the body’s energy at rest, which is twice the rate of other primates. In order to get that caloric boost—at least before supplementation and the availability of fruits and vegetables year round—meat and cooked meat were the only ways to get enough calories to support growth and maintenance. In most cases, there is a correlation between body size and brain size. Humans, however, have very large, neuron-rich brains for our body size. Gorillas, for example, which are much larger than humans, have considerably smaller brains and three-times fewer neurons. One of the studies, from a research team in Brazil, concluded the reason why a gorilla’s brain is smaller and features less neuron activity is because of its raw vegan diet. Gorillas eat plants virtually all day to provide enough calories to support their mass (as much as 80% of their 12-hour tropic daylight is spent eating). To develop their brains to human size and functionality, they would have to consume an additional 733 calories per day, or another two waking hours of eating. For early humans to develop their brain to the levels it was at hundreds of thousands of years ago with only raw vegetation, it would’ve required more than nine hours of feeding per day. There simply wasn’t enough time for humans to eat that much and develop their brains the way evolution has indicated. Furthermore, spending that time sitting idly eating would’ve posed many dangers like being attacked by meat-eating animals. A raw vegan diet was highly unlikely during evolution because food wasn’t available all year round. Cooked food lasts longer, can be stored all year, and provides the additional calories and nutrients associated with brain development. It’s estimated daily cooking became common practice anywhere from 250,000 to 800,000 years ago. Another study, recently published in the journal PLoS ONE, examined the remains of a pre-human toddler who died from malnutrition roughly 1.5 million years ago. The child, who may have still been weaning, died from porotic hyperostosis—a type of spongy bone growth associated with low levels of dietary iron and vitamins B9 and B12. The condition is the result of a diet lacking in animal products in a species that requires them. 1.5 million years ago, the only way to get some of these nutrients in the part of the world the child was living—modern day Tanzania—was from meat. Humans are known to have evolved in Africa, and it appears meat was what provided the calories, fats, and proteins for the brain to evolve. Now, all this doesn’t mean meat is necessary in today’s diet. It simply illustrates that eating meat is natural and played an essential part in human evolution. With modern refrigeration, supplementation, fortified foods and the availability of fruits and vegetables year round, a meat-free diet is healthy and offers sufficient calories and nutrition. When cooked properly—not charred or undercooked—meat is a healthy option and a good part of a balanced diet. If you avoid processed meat and high-fat cuts, you should have nothing to worry about by including it as part of a well-balanced diet. Wanjek, C., “Sorry, vegans: Eating meat and cooking food made us human,” NBC News web site, November 19, 2012; http://www.nbcnews.com/id/49888012/ns/technology_and_science-science/t/sorry-vegans-eating-meat-cooking-food-made-us-human/#.Uzll0FFdVD1, last accessed March 21, 2014. Jaslow, R., “Saturated fats not so bad for heart after all?” CBS News web site, March 18, 2014; http://www.cbsnews.com/news/saturated-fats-wont-raise-heart-disease-risk-omega-3s-wont-reduce-it-study/, last accessed March 31, 2014.